Pitchfork’s editorial staff moved to New York years ago, but the publication has maintained a strong connection to Chicago—one that goes beyond the fact that the city still plays host to Pitchfork Music Festival. Behind the scenes, the annual three-day event is overseen by local drummer and venue-owner Mike Reed, who has been curating and coordinating the fest since its inception in 2005. If you grabbed a beer in Union Park this weekend, it was likely served to you by a local jazz musician. And if you found yourself at Pitchfork on Sunday, there's a good chance that you saw at least one Chicago-based act. The local showcase started with an early-afternoon set from rockers Ne-Hi, who delivered a succession of reverb-drenched songs, including a cover of Harry Nilsson's "Jump into the Fire." Back at the Blue Stage, house DJ Derrick Carter got the crowd grooving ahead of a set from Chicago rapper Joey Purp, who celebrated the local hip-hop scene with a succession of guests, including Vic Mensa and Towkio, as well as plenty of water guns and balloons. Later in the afternoon, singer-songwriter Jamila Woods was promoted to the main stage after the Avalanches canceled their Pitchfork appearance at the last minute. She took full advantage of the switch, performing tracks from her Chicago-inspired LP, HEAVN, in front of a crowd that seemed to take the sudden lineup change in stride. 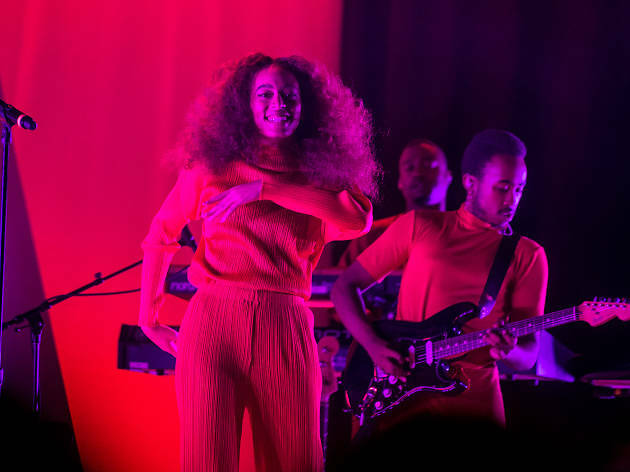 After a day that highlighted Chicago acts, Sunday ended with an anticipated set from Solange, whose presence had been felt throughout the weekend thanks to her Saint Heron pop-up shop at the festival. While the crowd for the evening's headlining performance was noticeably sparse (we might have the Game of Thrones premiere to thank for that), the enthusiasm of those in attendance more than made up for the reduced headcount. 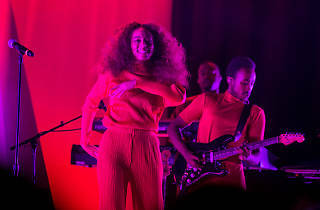 The younger Knowles sister's set offered a tightly choreographed trip through the graceful R&B of her recent album, A Seat at the Table, backed by a band that swelled to include more than 20 people onstage at several moments. It was easily one of the weekend's most striking sets—if you skipped it, you're obligated to listen to your friends tell you about how great it was.